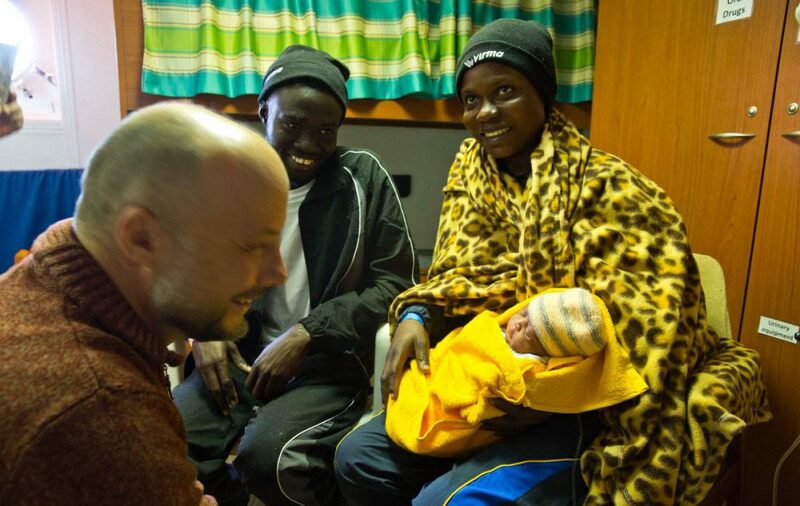 Mercy, the baby that inspired the song of the French duo that competes on Saturday at Eurovision, is one of the 35 babies that have been born in recent years on boats that rescue migrants, without a country or documents. Sung by the couple “Madame Monsieur”, the song Mercy is a tribute to those babies who, as the lyrics say, were born “in the middle of the sea, between two countries” and that represent life, the desire to live despite so many difficulties, to the wars from which their mothers fled, to the waves of the sea. Mercy, Newman, Francesca, Favor, Desiré, Alex, Salvatore, Sophia, Idriss, Ibrahim … all were born in a military, private or humanitarian vessel, while they were rescued in the Mediterranean. “We always try to evacuate the pregnant mother first so that she gives birth to land because on board it is not possible to face the complications,” Giulia Marinig told AFP, among Dattilo’s doctors, one of the ships of the Italian coast guard. On October 3, 2016, the young doctor attended the rescue to a thousand immigrants, when she detected a woman with contractions. “There was almost no time, the baby was born in less than 45 minutes,” he says. While the ship was heading towards Italy, another woman gave birth to a girl and a third another baby when arriving at the port. At least 30 women were pregnant on that boat. Although these mothers lie on the floor and their babies’ cribs are simple plastic boxes, these births represent a ray of light in the middle of black days with more than 10,500 rescued immigrants and about fifty drowned. For the rescuers, this is an exciting experience, which even the European Union baptized the naval operation Sophia in honour of a small girl born in August 2015 on a German ship. Since 2014, almost 80,000 women have arrived by sea to Italy, not counting the younger adolescents. Most are young and many are pregnant, although there are no statistics about it. “I met many women who had been raped in the detention camps of Libya or who sold their bodies to be able to leave in the boats,” says Marina Kojima, a Japanese midwife who spent several months on the humanitarian ship Aquarius chartered by SOS Mediterranean and Doctors without borders. Many migrants begin the journey with a newborn baby after having crossed the desert pregnant and lived in Libya in terrible conditions. For others, childbirth at sea is another nightmare. According to the maritime law, it is considered that children born on the high seas were born in the country where the vessel is registered. Many are boats with the flag of Italy, but being born on their soil does not give them the right to have the nationality of the country where they are born. Mercy and her mother were accommodated at a reception centre in Sicily, the largest in Europe, where hundreds of people await an answer to their asylum application. Following the advice of the German sailors, Sophia’s mother sought asylum from Germany. All mothers have only one hope: that their children go to school so that they have a less precarious life than their birth was.